I regret to inform that WWE Superstar Eddie Guerrero was found dead inside of his hotel room in Minneapolis, Minnesota Sunday morning. Eddie is survived by his wife Vickie and daughters Shaul and Sherilyn. They will perform a autopsy in Minneapolis on Monday, and his body will be flown to Phoenix. Funeral arrangements are schedule for Wednesday in Scottsdale, Arizona. As I sit here a write this I wish that this was just another cruel angle done by WWE. Unfortunately that is not the case. Eddie was one of my favorite wrestler. He showed so much charisma and athletic ability inside of the ring. Eddie always gave you 100% when he was inside of the squared circle. Ever since I watch the DVD, "Cheating Death, Stealing Life - The Eddie Guerrero Story", I develop a higher level of respect for Eddie. The demons and obstacles that he overcame to become successful in his WWE career. 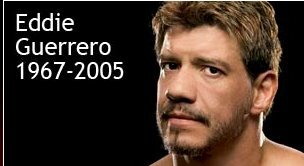 I will truly miss Eddie Guerrero and my thoughts and prayers go out to the entire Guerrero family. Even though Eddie is no longer with us in the physical form, his spirit will always live in our memories and in his matches. Lie, Cheat, and Steal forever Eddie you will be missed.